New insight into science that seems, on its surface, exceedingly simple — what happens when you add salt to water — could ultimately lead to a better understanding of biochemical processes in cells and perhaps advance sources of clean energy. An article  published in the Journal of Physical Chemistry Letters  on that topic earlier in 2017 has generated considerable interest, according to the journal’s editors. The article was written by Giulia Galli, a Liew Family Professor in Molecular Engineering at the University of Chicago who has a joint appointment at the Department of Energy’s (DOE) Argonne National Laboratory, and Alex Gaiduk, a Natural Sciences and Engineering Research Council of Canada postdoctoral fellow at the University of Chicago. “One of the questions that has puzzled researchers for decades is how far ions affect the structure of saline water, the same kind of solutions that are present in our bodies,” said Gaiduk, a chemist and theorist. One popular view is that ions have a local effect on the structure of water, causing hydrogen bonds to form or break only close to the ion. But it seems that isn’t always the case. Meanwhile, molecular simulations provide first-hand information about the molecular structure of the liquid and can shed light on the ions’ influence on the water structure. Determined to answer these questions, Gaiduk and Galli turned to the Argonne Leadership Computing Facility  (ALCF), a DOE Office of Science User Facility capable of carrying out simulations that require massive computational capabilities — 10 to 100 times more powerful than those of systems typically used for scientific research. The research provides a new fundamental understanding of sodium chloride in water. This is one of the aqueous systems used in photoelectrochemical cells. These cells are used to split water into hydrogen and oxygen, a technology that has long-term potential as a clean energy source. Additional research will be required to determine how this new understanding might be used to improve the technology, Galli said. Their finding could also prove valuable for biochemistry on a number of fronts. However, the authors concluded that the subtle modifications of the structure of water by the ions — even chlorine — are probably insufficient to explain the different solubility of biomolecules in pure and salty water. Clearly researchers have more work to do before they can fully understand and model interactions of ions with the functional groups of proteins. 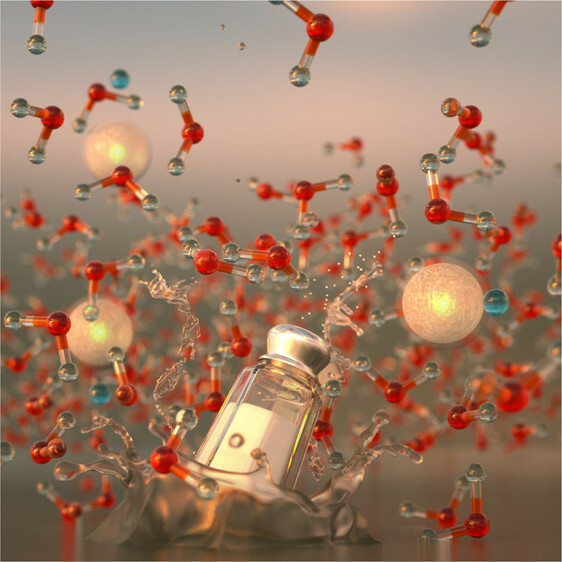 However, their technique for analyzing the hydrogen bond network of water is a first step to help scientists understand how the structure of water changes with the addition of salt. Using the results obtained by Gaiduk and Galli, another research group has developed a new model that correctly describes the effect of ions on the structure of water. Their findings  are detailed in the Aug. 31 issue of the Journal of Physical Chemistry B. Funding for the work by Gaiduk and Galli was provided by DOE’s Office of Science, Basic Energy Sciences through the Midwest Integrated Center for Computational Materials and the Natural Sciences and Engineering Research Council of Canada. Computer time was provided by the Innovative and Novel Computational Impact on Theory and Experiment (INCITE ) program. A research team led by Argonne’s Giulia Galli has gleaned new insights about the structure of salt water by simulating the liquid at the molecular level with the Mira supercomputer, housed at the Argonne Leadership Computing Facility.